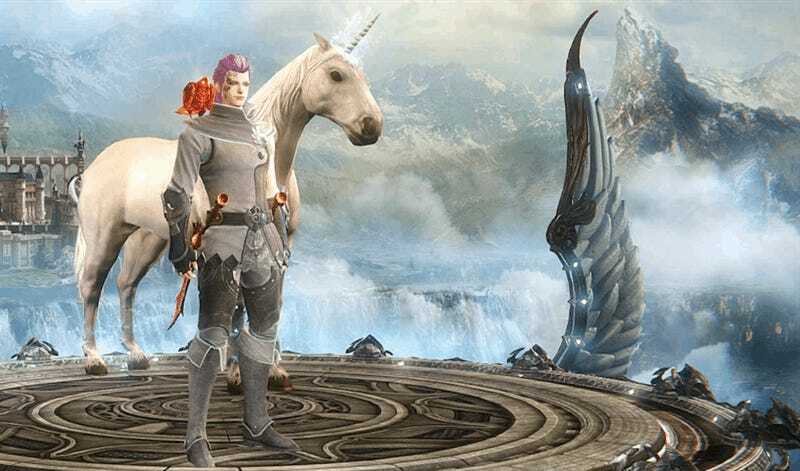 You will not ride a majestic unicorn within the first ten minutes of Riders of Icarus, Nexon’s free-to-play massively multiplayer online role-playing game, which launches into free open beta tomorrow. That’s for 20 minutes in. First comes the pegasus. One of my favorite things to do in MMORPG games now that I am pretty much married and no longer able to cause relationship drama, is collect pets and mounts. A major aspect of Riders of Icarus, developed by Korea’s WeMade Entertainment, is riding, oddly enough. This involves capturing and taming hundreds of beasts and training them to be your best friends forever. It’s like Pokemon you can ride, with a mix of on-foot and mounted combat. Of course one has to build to that sort of thing. The first ten minutes of the game following character creation are a bit of scripted dungeon running that leads into some pretty basic fetch and kill quests. Check out the video of my first ten minutes (not including character creation) below. It’s not a comprehensive look at the game by any means, especially considering the first mount-taming quest arrives around the 20 minute mark, but it should give folks who’ve never heard of the game an idea of whether or not the free download is worth their bandwidth. Have you played Riders of Icarus? Share your experience with the group in the comments below.